Location: This is a loop so you can start it wherever you like but I prefer to star/end it in Tri-City Estates. This is one of my favourite long runs around Cold Lake. It is very fast and extremely flat (about 180m of elevation gain and loss over 34km). The countryside roads are quiet and the motorists are generally very courteous (as long as they see you - so wear a bright shirt). I generally start this run in Tri-City Estates and run the loop CW. Washrooms: Located at Tim Horton's in Tri-City Estates, community garden porta-party outside the Energy Centre (in summer), inside the Energy Centre, gas stations in Cold Lake North, washrooms in the first parking lot at the Cold Lake Provincial Park (if you want to make a detour at the NE corner of the map above) and there may be washrooms at the Grand Centre Golf Course but I have not used them before. The busiest section of this long run is the road leading to the Kinosoo Ridge Snow Resort. Once you are off this road, the run gets significantly better and much quieter. The majority of the roads on this run are lined with trees, which provide shade from the +30C heat in the summertime and a wind block from the -30C cold in the wintertime. You can run this route all year around. The roads are moderately cambered so I like to run facing traffic for half the run and with traffic for half the run (on the roads that are less busy). You can really get into a nice groove/pace running this loop. The roads are very clean and in good condition for the most part (when they are not under construction as they are currently (Sep 2017)). Once construction is done, this is going to be an even more amazing long run. Alternates: If you don't want to run the complete 34km loop, then you can just do the "upper left box" in the map above (approx 18km, I believe). Also, when you are running eastbound on the road to Kinosoo Ridge, you can turn south a little earlier (on Range Rd 415 (as per map above) or Range Rd 15 (as per Google Maps)). I believe this would reduce the distance by about 5-6km. Advice: As of 28 Sep 2017, there is construction occurring on Range Rd 15A and on the road to the Kinosoo Ridge Snow Resort so I would not recommend running on these two roads until construction is finished. Update: As of 28 Apr 2018, construction appears to be complete on Range Rd 15A. This road is now very likely the fastest road to run on in the Cold Lake area. I love it! The surface is relatively soft asphalt that has minimal camber. The lines have not been painted on the road yet. I recommend running facing traffic and wearing brightly coloured clothes for better visibility for the motorists. 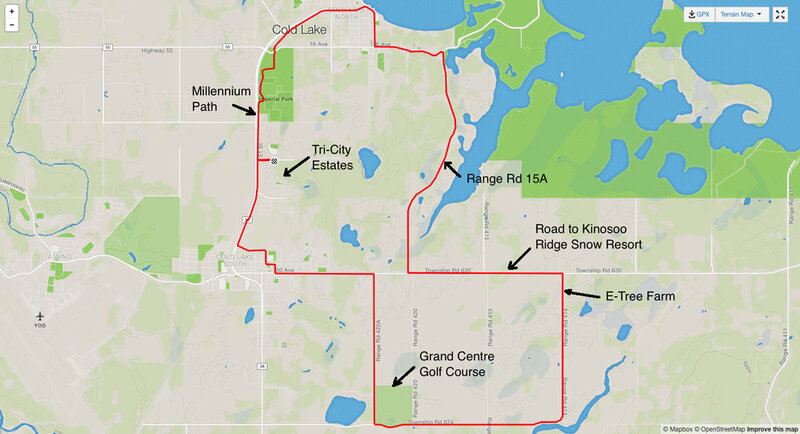 Country Lane Estates is one of the fastest places to run in Cold Lake. 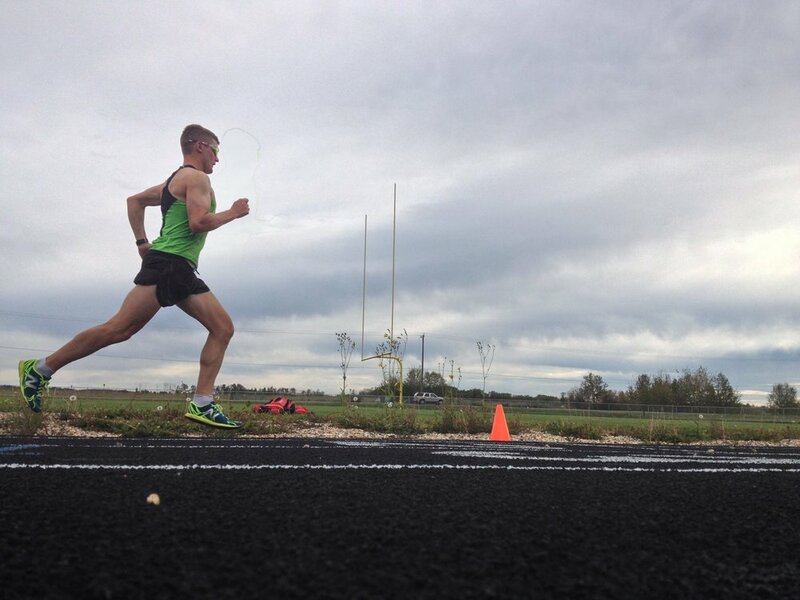 It is my go-to location for doing workouts such as tempo-pace and interval-pace sessions. This is not really the place to go and do an easy run but it is the perfect place to do a fast workout. The arrows on the map above designate the route that I typically follow. I find that this is the safest and fastest route since you don't have to cross over the road at all (except once for the 180 degree turnaround). Running north on Range Rd 423. I usually start my session at the cross (see map above and photo below). If you rode your bicycle here, you can lock it up around the fence. One of the reasons I like starting at the cross is because there is a slight downhill when running west before crossing over the creek. Large cross marks the start point. This is an amazing place to do fast running workouts. The surface of the road is smooth and clean so you can wear thin, light flats and not have to worry about stepping on rocks or gravel. The slight downhill just west of the large cross. The road has minimal camber. Camber is the curved cross-section of the road (i.e. the road is highest in the middle and lower at the shoulders - this allows water to run off and not pool in the middle), Zero camber is ideal for running. I believe that running on a road with less camber means that you are much less likely to get injured and sustain overuse injuries. I generally run facing traffic for the first half of the workout and run with traffic for the second half of the workout. Having a bicycle pacer with front and rear lights allows motorists to see you better. One of the residential areas that you run through. The road pavement is relatively soft but not too soft. After running 6,000km per year for many years, you develop a very good sense of how hard a surface is to run on. I can say that the surface of the road in Country Lane Estates is pretty much ideal. The entire circuit around Country Lane Estates is extremely flat! There is minimal motorized traffic and the speed limit is mostly 50 kph. Motorists are very courteous. It is extremely beneficial to have a friend on a bicycle who can pace you. I recommend that the cyclist have a bright white blinking light in front and a blinking red light in the back. The cyclist will also block the wind for you too. It is much easier to maintain a fast pace with a cyclist setting the pace rather than running completely by yourself. Advice: I would not recommend running here during rush hour traffic but it is really nice to run here on the weekends. Wear a bright colour of shirt like fluorescent orange or fluorescent yellow. This allows motorists to see you. Remember, "an ounce of prevention is worth a pound of cure". Stay tuned for Matt's Favourite Run #5! The Iron Horse Trail is a recreational use trail that was formed when the rail line used by the Canadian National Railway from removed. I believe the train tracks were pulled up around 2000. For full details of the complete Iron Horse Trail, please visit ironhorsetrail.ca. The Iron Horse Trail is not really an amazing trail in itself but if you follow it for about 5-6km from the Jackson Field Track, then you will get to an amazing old train trestle bridge that was built in 1930. Seeing this bridge is definitely worth the run. The trail surface is mostly gravel, which is fairly soft, albeit slower so this is a perfect run for your easy run days. The soft surface allows your body to recover. Don't worry about your pace on this trail as it will likely be slower than usual. Most people start this trail near the Jackson Field Track. There is ample free parking in a gravel parking lot at the trailhead. From the "Cold Lake Staging Area" sign, simply follow the gravel trail initially west then south-west. After about 1km, you will get to a fork in the trail. Take the left fork and then continue straight for another 4-5km. The middle of this map shows the fork. Take the left fork on your way out. The Iron Horse Trail is about 4m wide. The majority of this trail is gravel with a few sections being dirt or mud. After about 4km, you will get to a small bridge. This is not the main train trestle bridge that you want to go to so keep running for another 500m to 1km farther. As you can see in the photo below, the Iron Horse Trail does get muddy when you get closer to the old train trestle bridge. This is the first small bridge you will get to. Keep running. Once you have covered 5-6km, you will come to a large old train trestle bridge that was built in 1930. It was vandalized a few times but thankfully it has now been restored. It really is a beautiful place to go and is definitely a local gem. You can walk right out onto the middle of the bridge. The deck height is about 30 to 35m off the water below. There are occasional boardwalks that jut out from the bridge deck and this lets you see a nice view of the side of the bridge. Jordan Vadala looking over the edge. The view from the top of the bridge is very nice. You might even be lucky enough to see some wildlife, like the deer swimming in the Beaver River below. Advice: I do not recommend running on this trail after it has rained as it will be very muddy and not enjoyable. Keep your eyes open for ATVs (and maybe even full size vehicles) as this trail does get used by motorized vehicles. Overall, the Iron Horse Trail is a decent (albeit relatively slow) trail to run on. The old train trestle bridge that you see once you get to Beaver River is definitely worth the run. Stay tuned for Matt's Favourite Run #4! Location: Cold Lake South in between the RCMP Detachment, the Holiday Inn and Assumption High School. This is one of the nicest tracks I have ever run on and it surprises me that few people know that it even exists. It is pretty much brand new having been built around 2012 or 2013, I believe. If you wanted to run on a track like this in a big city, you would have to book it in advance and pay to use it. 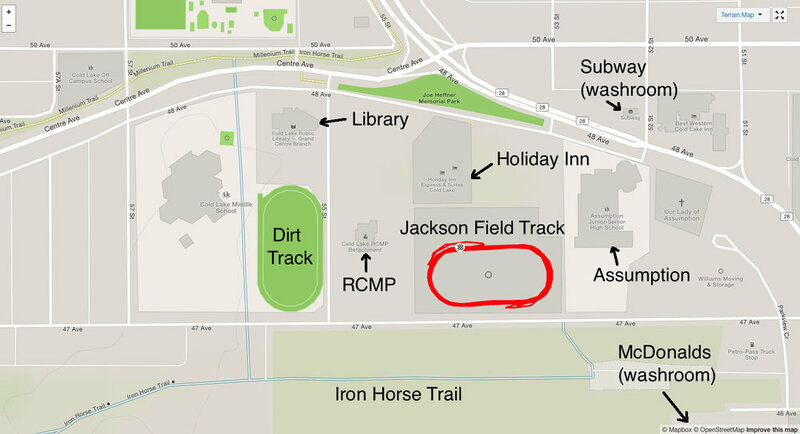 Jackson Field Track in Cold Lake is free, open 24/7 and is never crowded. It is the perfect place to run fast. 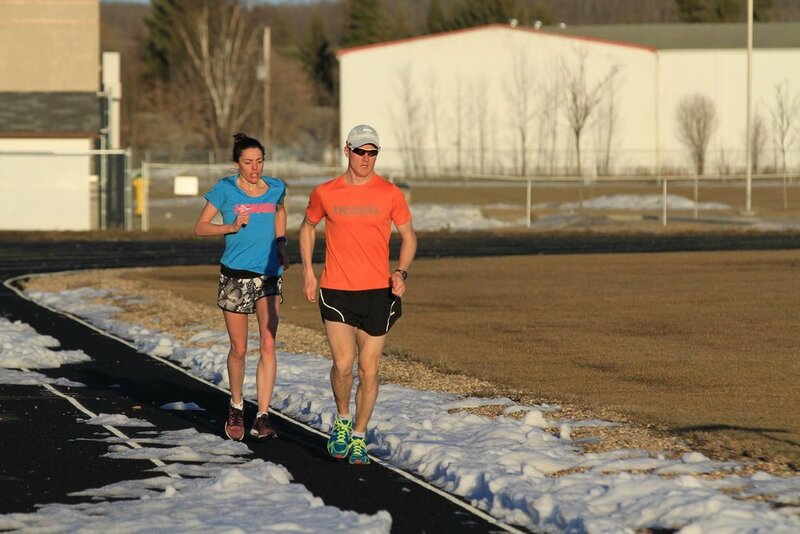 If you're looking for an amazing place to do intervals or even a longer tempo run with very consistent pacing, Jackson Field Track is the place to go. Shovelling snow off the track in the spring is also a way to warm-up. Warm-up: As a warm-up, I typically run to the track from Tri-City Estates, which takes about 20 minutes. I you prefer to drive to the track, there is ample free parking all around the track. You could warm-up on the track or on the gravel Ironhorse Trail. There is also a gravel/dirt track one block west you could warm up on. Using an orange cone as an aiming point. Washrooms: During the spring and summer, there is usually a porta-potty (portable toilet) located right at Jackson Field. Otherwise, you can run to McDonalds, Subway or the Library (I believe the Holiday Inn also has a washroom). Looking west towards the dirt track just past the RCMP Detachment. 8 to 10 of 60/40 seconds @ interval/easy-pace. I usually do this one a few days before a race just to get the fast leg turnover. Advice: I like to bring along orange cones to place on the start line and 200m line because I find it helpful to have an object to aim for when I'm running. If I'm warming up/down on the track, I usually run around the track CCW and then do the session CW (the standard direction). Stay tuned for Matt's Favourite Local Run #3! Start/End Location: I usually start/end this run in Tri-City Estates but you can also start/end it at the Tim Horton's near Staples/Canadian Tire or the Cold Lake Provincial Park (shorter version). This is a really quiet and relaxing trail to run on. There are no motorized vehicles around except for the occasional ATV. It is one of my favourite trails in the area. The route described here is only one of many different possible trail options. Starting at the Tri-City Tim Horton's, run east towards the Museum and then turn left (north) when you are at an opening in the trees about half way there. Go through the opening past a muddy depression and veer to the right (NNE) on a ATV trail. Once you leave the road and go through the opening in the trees, you should see something similar to the trail below. Keep following the main trail (there are A LOT of ATV trails in this area). Keep running in generally a NE direction. Cross up and over a gravel/dirt road and back down into a green farmers field. Keep following the trail through the field. This field is perfect for doing cross-country interval sessions (as is the adjacent field to the north). You will get to a 4-way trail intersection (about 300m ahead of where the above photo was taken). The right (south) goes to toward the Museum. The straight option (east) goes towards the African Lake bike trail (not recommended). The left option (north) is the direction you want to go. This is the trail intersection. Go left (north) here. You will run up a slight incline on a trail through a farmers field and eventually get to row of trees/bushes that separates the fields. Go through the opening and take an immediate right (east) turn. You will then get to a muddy depression (it's always muddy here), which you will have to go around it. The muddy depression is you crossing over the African Lake bike trail (not recommended). Keep heading east through the muddy depression and into another field. You will eventually see the back of some houses on your left. Keep them on your left side until you get to 16 Ave / Township Rd 633, at which point you run up onto this road/highway and follow it east until you get to the Cold Lake Provincial Park (CLPP). Take the first left after you get into the park and you will pass by a couple of parking lots and a washroom. You can do the CLPP loop in any direction but I like to run CW (the lakeshore is always on my left). Once you get back to the CLPP parking lot, you can turn around and follow your trail back to Tim Horton's in Tri-City. Training for cross country (XC) races because the surface of the terrain and rolling hills is exactly what you can expect in an XC race. There are MANY ATV trails in the fields between Tri-City and the Cold Lake Provincial Park. There are a lot of good fields where you could do a interval session if you bring your flats or spikes along. The ground is nice and soft especially after a light rain. If you don't want to run to the Cold Lake Provincial Park from Tri-City, you could drive to the park and park in the parking lot. Then do the "Cold Lake Provincial Park Outside Loop", which is approximately 6km. The trail is extremely nice and very well maintained. The park attendants keep the trail clear all year around. Typically within a few days of a tree falling over the trail, it is removed. Very impressive! As shown in Strava segment entitled "CL PP Around The Outside", the fastest time that this 6km trail segment has been run in is 22:34. If anyone runs this segment faster than this, I will buy them a beer. Stay tuned for Matt's Favourite Local Run #2!